Well packaged. These were a breeze to assemble and look gorgeous. I did receive the 2 lightbulbs stated. Snakeskin is more matte. It has visual depth, but does not have the actual texture of real snakeskin. The color is more brown with a grey haze. It says it can go to a max of a 100W bulb. I only wish the light had more settings. 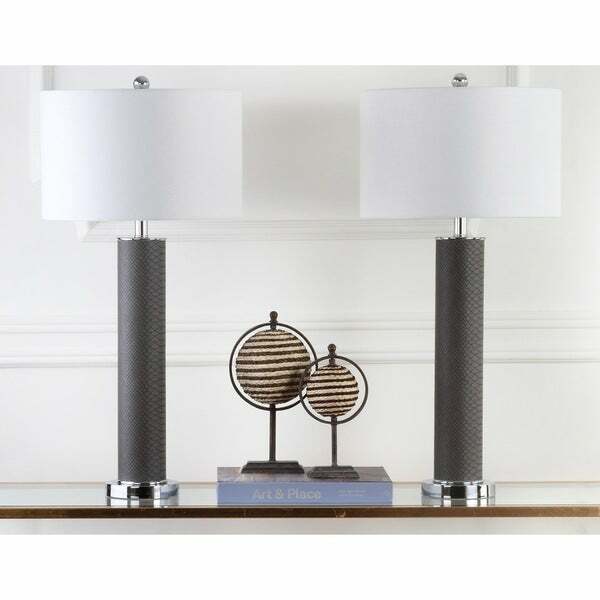 Enjoy additional lighting while you're reading or working with this set of two table lamps. Featuring a grey base with a faux snakeskin pattern, complemented by a white cotton thread shade, this lamp gives your home a modern look. The two included 13-watt bulbs are energy-efficient, helping you reduce power consumption. In the ad it was stated that CFL 13-watt bulbs would be supplied with the purchase of the lamps. Inside the box was a directive to find important parts such as the harp, the ball at the top of the harp, and the bulb should be carefully found and not thrown out. I was very, very careful since I'm a compulsive obsessive but, alas, no bulbs. I still give five stars because the lamps are beautiful! They are more than I expected. I had to go out and buy the bulbs but I came back home to enjoy being able to turn on the lamps--happiness is something that makes your home wonderful! Overstock I love you despite your not keeping your promise . . . your lamps made me very happy! Love the height and color of this set of lamps. They were quick to put together and look great in my theater room. They are a nice quality and I would buy again if you are looking for something different then what you see out in the stores. Compliments our re-designed living room, easy assembly, rich look. Cheap light bulbs included. Change to a more warm light bulb and these are magical. Very contemporary look. They look good on Driftwood nightstands. Would also look modern if used with glass tables. Bright white shades offer good lighting. These are tall lamps but perfect lighting for bedroom reading. Faux finish very nice. The shades have a linen finish on them which make them even more expensive looking. It came in great packaging. Both lamps were good quality. The base of one of them has some yellow markings but it's not a big deal. Even the lights bulbs were included. Love these lamps! Used them on end tables next to daybed. The tall height is good for light distribution. They have gotten lots of compliments. Would recommend at 5 star level. These lamps have lightened up my bedroom where I have some very dark furniture. I really like the look and the faux snakeskin gives them a nice textured look. Really great quality and style for the price. Perfect tall size for what I was looking for. Love the round shades with it. I love the lamps. They look great in my living room. I have received lots of comments on my lamps. The size is just right for my tables. Not to small not too large. The gray snake skin is perfect. Beautiful, modern and sleek design. These lamps are even more beautiful in person. I would highly recommend them to anyone seeking stylish lighting for any room. Loved these lamps when I sa them online they were going on a hammered steel table which we also bought from Overstock.com. BUT...Today the lamps arrived. To my surprise the damaged box was in a ne Big box which wasn't damaged. The shades ere busted, bent felt on the bottom of the lamps off and tiny balls of Styrofoam everywhere. I chatted them up online and they sounded as disappointed as I was and offered to replace or refund the items. Thank you Overstock. BTW I chose the refund ...because the snakeskin part felt like wallpaper on cardboard. Nicer in the online picture. Love these lamps! I got them for our family room and the texture on them gives them a rich look. One of the shades was dented but they sent a new set immediately upon calling. The Safavieh 31.5 " lights are nice. Shades are a perfect shape and size, the light fixture is a pain to put together. They came VERY well packaged Lol. Love the height and appearance. Wish the printed cylinder was attached. Feels some what cheap. I just love there lamps and the way they stand out in the room I have them in and I have had so so many wonderful compliments on them. Fantastic buy for my new den...matches everything, strong and sturdy and beautiful. My husband really likes them...so there's another positive review for you! "Can you use a three way bulb in these?" "can you use a 100 watt incandescent bulb in this lamp?" The maximum wattage on this item is 13 W.
My son is moving into his own place and liked these for his room. love the streamline look. simple, clean and ultra sharp! The height for this item is 31.5 inches.